Throxenby Mere with three tree trunks which provide seating for picnics or bird watching. 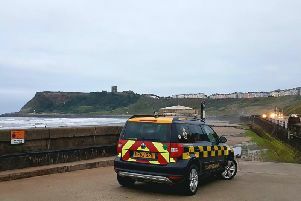 One of our favourite walks on the outskirts of Scarborough, is this five-mile route of easy walking, even in wet weather! There’s a natural lake, scenery to ancient woodland, historic buildings, lovely village for refreshment mid-way, and an enchanting return along the dis-used railway. Access by private transport or local bus is detailed later. Take the A171 Scarborough to Whitby Road, and just beyond the Scarborough Hospital, the Yorkshire Coast College is a prominent landmark from where this walk begins – on Lady Edith’s Drive. A tree-lined footpath with grassed verges, and ditch to the left, soon leads to Raincliffe School. Throxenby Hall is set in extensive grounds to your right. Take care as you round the bends in case of speeding vehicles! There before you lies a small natural lake – Throxenby Mere, with a little car park close beside the road, and three tree trunks providing seating for a picnic, or bird-watching. The mere retains around its margin, horsetail and sedge, reedmace and yellow flag, and the more unusual bogbean and marsh cinquefoil. Leave the road here (as the narrow roadside verge is too overgrown for safety). Instead, bear briefly left beyond a tree trunk, and seek a board-walk to the right which follows the western bank of the mere to its northern end. Continue on a path which may be muddy, to regain the road. From the road, bear slightly right to cross with care to an ‘island’ of trees. Here, turn left into Red Scar Lane. What views unfold across to Scalby Nabs, Hay Brow, and ancient woodland of Raincliffe Woods. Following a gentle rise to find a seat overlooking the splendid scene, descend past a 30mph sign and second seat. To your right are properties. Can you find the superb caterpillar hedge? Try number 51. The lane levels as it approaches a road junction. Here turn left as signed to Hackness. Follow the verge footpath and cross Scalby Bridge spanning the sea cut. Your vigilance may be rewarded by a glimpse of a darting kingfisher. Keep beside the railed ditch, pass a tall monkey puzzle tree, and take the wooden footbridge over the beck at Scalby green. Turning right up Church Hill, pass the old school dated AD1861 which is now Scalby Church Rooms. Just beyond is St Laurence’s Church elevated from the road. It’s the oldest building in Scalby. A picturesque lych gate provides access to a beautifully maintained church yard, and a church to be visited. From the vicarage is a fine avenue of lime trees known as the 12 apostles. Rest beneath a spreading sycamore tree just ahead, beside a fountain commemorating the diamond jubilee of Queen Victoria on 20-6-1897. Keep straight ahead at the cross road. The Nag’s Head Inn to your right, is the oldest pub in the village. To your left is the Yew Tree Cafe, and beyond is The Plough hotel, and Scalby Stores for refreshment. Approaching Scalby Road, do halt beside Yew Court. Built in 1742, this gracious building is dominated by six tall yew trees to each side of an impressive gateway. Notice the windows in the gateway? Food used to be passed through these to nuns travelling from Bridlington Priory to Whitby Abbey. Cross Scalby Road with care to continue along Station Road. Keep to the footpath alongside the tennis courts and bowling green etc. Pass a post box near a bus stop, and turn first right down Chichester Close. Flats are to either side, but seek number 23. From here turn right as signed, ‘Scarborough to Whitby Railway’. Bear left beneath shady trees, and follow left garden fencing past bungalows and between railed barriers onto a railway track, now part of the National Cycle Network. It’s very easy to trace, and is so popular with cyclists and dog walkers alike. Keep to the obvious track, as it first crosses a brick-walled bridge spanning Scalby Beck, far below. Next, negotiate barriers near Newby Farm estate – a lovely contrast of scenery. A similar barrier lies just ahead. Walk beneath the stone-built bridge, and past a golf course screened by pine trees – a relaxing scene. To your right feature properties along Queensway and Princess Close. The next roadbridge overhead is the union of Green Lane and Cross Lane. There may be a little mud beneath the shade of trees, but it’s easily negotiated! Shortly, St Peter’s School and Northstead’s playing fields lie to your left and you’ll have observed an excellent recreation area off right for ball games and mountain bikes’ ‘humps and bumps’! Your tarmac path keeps close company with the left, hedged perimeter of a housing estate. Seats and litter bins are found beside the extensive football fields, and seem to be well-used! Allotments are screened by trees and bushes to the far right. At the far end, leave by a fenced barrier and keep straight forward, with cemetery railings on the left. A broad driveway overhung by beech trees, with flats overlooking the cemetery, leads to a road at Woodland Ravine. Go beneath this bridge, and turn immediately right past a small recreation area into Woodland Ravine. Remain on this attractive, tree-planted walk midst lawns, bushes, and flowers in season. A beck winds its way along the ravine, and seats punctuate your stroll towards Scalby Road. Grey squirrels are likely to be observed here – especially if there’s food being consumed! Reaching Scalby Road, turn right to cross an ‘island’ of trees at the junction of Woodland Ravine and continue heading north up the quieter Old Scalby Road. This returns you to your starting point. Access: By any of these buses from Scarborough: 13, 14, 15 and Arriva buses 93 and 93a. Dismount at Lady Edith’s Drive. Distance: Five miles of easy walking. Mostly level. Refreshment: In Scalby village, the Yew Tree Restaurant, Nag’s Head and Plough Inn, plus Scalby Stores. NB. Yew Court, Scalby features in paintings by Atkinson Grimshaw.